US intelligence officials have unveiled a once top secret scale model of Osama bin Laden’s hideout in Pakistan, a precise replica used to plan the raid that killed the al Qaeda chief a year ago. 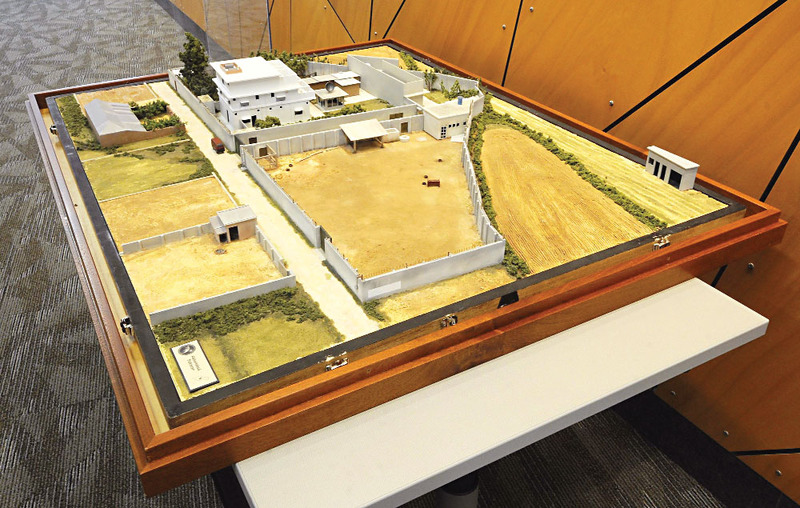 The table-top model made its public debut on Wednesday in the halls of the Pentagon, where soldiers and office workers stopped in the corridor and gazed in fascination at the elaborate miniature of Bin Laden’s compound. With farm fields carved out of clay and the building’s walls made of styrofoam, the model was built in six weeks by a special team at the National Geospatial Intelligence Agency (NGA). The NGA brought the model to the Pentagon “to show service members first hand what it is they’ve been hearing about for the past year,” she said. “They’ve seen cartoon graphics of it, but until you lay your eyes on the actual model, you really don’t get the full scope of the Abbottabad mission,” she said. Officials had said previously that US commandos rehearsed the raid at a full-scale model of the compound, but the NGA’s miniature model had painstaking details, including concertina wire on the compound walls, a dark red minivan parked out front and a white Land Cruiser inside the compound grounds. The team that constructed the replica is part of a permanent “model shop” at NGA that creates scale models to help bring to life sites captured in satellite imagery, officials said. The model on display on Wednesday afternoon may be the original but officials said copies of the replica were also constructed. The scale of the Bin Laden compound model is one inch to seven feet. “It really puts it into perspective how large the compound actually is — or was, sorry, because it no longer exists,” Fouche said. After US Navy SEALs killed Bin Laden in a daring nightime assault on May 2 2011 in the garrison town of Abbottabad, Pakistani authorities later razed the building that served as the Al-Qaeda mastermind’s home for five years. These Americans are really very naughty, when we have demolished Bin Laden's compound to erase the painful memories in our struggle for survival then the US is trying to refresh our wound by displaying a scaled model of Osama's hideout compound.